The Tower is, without a doubt, a major with a very well defined, strong message. Regardless of what deck I am working with, when THIS comes up in a reading, I have a good idea of where to begin reading/what it could mean. It's been kind of a theme in my thinking about life for a while now, so pretty familiar with this card, and actually do have a certain odd fondness for it. That said, it was rather difficult to pick out favorite cards for this one - not because there were so many that I loved, but rather the opposite. Not that I actively dislike most tower cards more...I feel neutral towards many. They are nice enough, and they get their point across well. But very few, I find, really shine either aesthetically or conceptually. There's a lot to like about this tower card, for me. Firstly, the color scheme makes a nice change from the warmer tones found in many Tower cards I've seen, all the runny blue and purple. I also like the idea of the tower as a tree type dwelling...once very alive, vibrant, now old and rotting. The lighting ignites it, which is in fact what happens in nature all the time to trees, and here we see the result. The burning of the branches and leaves, the coming apart of old things. The composition of the images is also quite nice and works well for really seeing what's going on in the card. 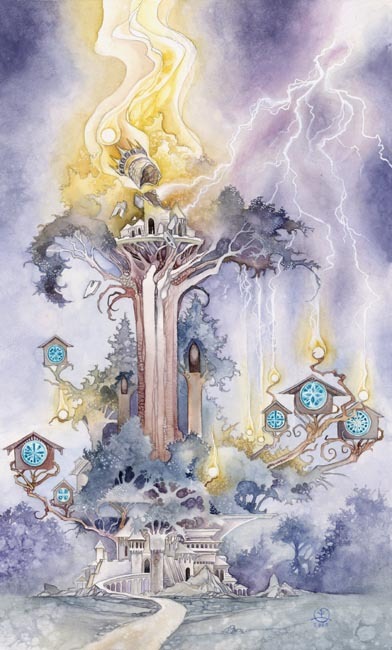 It's a pretty simple tower card, overall, but the color and the metaphor especially really work for me. Another from the Thoth, ha. What can I say? There's a reason this deck so rapidly came to be one of my favorites... But yeah, the card is very...put together. 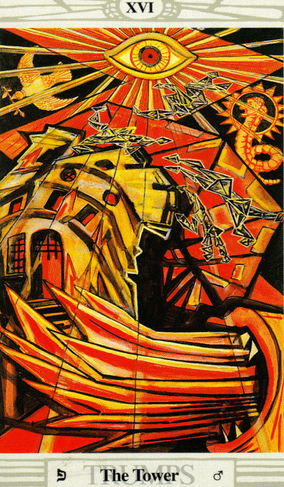 The reddish-orange color scheme meshes perfectly with the card's Mars association; the black tones exemplify the darker, more difficult aspects well. Love the art style - it really is a visually stunning image, and one that really, really does not pull it's punches insofar as the meaning of it goes. Lots of great symbolism - the eye of shiva, the dove in the corner, the bars in the windows and doors of the breaking tower, the crystalline figures falling out of it, so afraid they will break apart when they fall... There really is a lot to latch onto, and unsurprisingly, I've gotten some really good readings when this card came up in the spread, both for myself and others. And honestly, the mouth in the bottom corner of the card...silly amusement on one level, a certain extra level of fondness for the card.